A few years ago, I took a trip around Europe visiting friends, finding myself, the basic Euro-trip. Thanks to a friend of a friend gladly taking me in, I was able to stay in Paris for two weeks. During this expanse of time, I wandered through the Musee d’Orsay, dined solo, flipped through used books on the left bank of the Seine and spoke plenty of broken french. But the main focus of my time spent in Paris was on little hole-in-the-wall cafes and patisseries and chiefly, their chocolate croissants. Chocolate croissants have always been a passion of mine, a cafe go-to, a source of very particular, high standard snobbery, and a definite feel-good treat. This all started in LA, my hometown, with a series of early morning trips to one particular coffee shop with my dad. I would get a chocolate croissant, he would get a double espresso, and we’d play cards until he had to drop me off at school. I developed my favorite coffee shops based on their chocolate croissants and since then, I’ve been on a constant mission to taste and judge every good looking chocolate croissant that comes across my path. Well in Paris, this could have been a full time job. And during my stay there, I treated it as such. I found two sources that blew all the others out of the water. One of them was La Duree, a pricey and extravagant Parisian pastry shop that greets its guests with wall-to-wall glass cases of pastries, bon bons and a rainbow of macaroons. The chocolate croissant was beautifully made, technically flawless, down right scrumptious and held first place for the first half of my trip. What La Duree is really known for however, are their macaroons, a little box of which I later received as a very short-lived and well-appreciated gift. The other source was the patisserie Lenôtre on the Avenue de Victor Hugo, which was recommended to me by a fellow cafe-goer and pastry hound, and whose bounty I enjoyed on a park bench along one of the innumerable, gorgeous, tree-lined avenues of Paris. 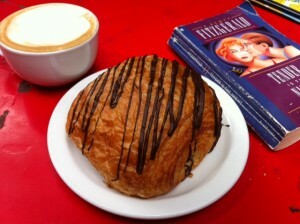 I don’t remember the details of the croissant but I do remember journaling about it and using the word “transcendent”. While meeting the necessary qualities of a superb pan au chocolat, this particular heaven-sent specimen also contained a quality, or an air about it, so ineffable and sublime that it was sky-rocketed from a mere pastry to an experience of divinity. My journey quickly ended later in my trip when I left la belle Paris for Prague, where one peek into the pastry case of a cafe enclave cut out of one of the severe, vaulting, stone edifices customary of Prague, was enough to transfer my pursuance from chocolate croissants to pilsners, sausages and dumplings. But now, several years later, I’ve decided to re-awaken my search in Boulder, Colorado. My first official stop in my documented search was Piece, Love and Chocolate on the west end of Pearl street, a little chocolate boutique which I had, before this stop, adamantly refused to patronize based solely on the fact that their clever punny name is confoundingly and irritatingly un-clever, and as far as I’m concerned, spelled wrong. But stepping into the shop for the first time and starting to peruse the glass cases of bon bons, I felt immediately duty-bound to try much more than just a chocolate croissant. I somehow however, sat down inside with just my pastry. It looked promising. 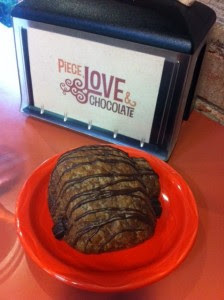 Shortly after biting into it, I realized that this chocolate croissant was done a little differently. Instead of being made of regular croissant dough and just being filled with chocolate, the dough itself was brown and chocolate infused. At first, the purist in me was appalled by this brazen stray from tradition, but it eventually grew on me. The dough, although chocolatey, was still a little sour, not sweet (interesting- not just exploiting sugar to make up for bad quality) and the filling inside was done perfectly; they nailed the quantity, flavor, and the dark, grainy consistency reminiscent of chocolate heated over a stove-top. Mmm! I give it a 7. Before going on, I should probably list the qualities of what makes, in my book, a stellar pan au chocolat. 1.Flakiness- spana kopita-esque flakiness. Yet still dry, not greasy. A good chocolate croissant is nearly impossible to eat without making a huge mess- it should be a full committed experience.a) As a corollary to (1) and at the risk of stating the obvious: chocolate croissants should not be bready. 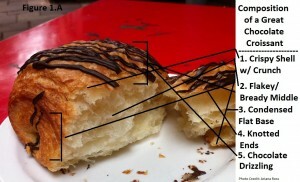 With that being said, within a good chocolate croissant, consistency should vary: flaky top, tougher knotted ends (see figure 1A below) and a sturdy condensed base. 2.Just to nail home this point, bare with me whilst I rant a little longer about the ever-so-important croissant dough. Proper croissant dough is made from rolling dough out into large sheets, thinly painting the dough with butter, and folding it. This is done several times, alternating between buttering and folding the dough and chilling it in the fridge, limiting its ability to rise. The final product is let out to rise before baking for a very short time at high heat. This process makes for flaky, crispy dough, more like stacked layers of filo, than leavened bread. Cheaters however, skip this tedious process and instead opt for un-properly-processed or frozen dough, making for a pastry that is squishy with thick, leavened sacrilege, ie. bready! 3.Chocolate croissants should not be too sweet. We’re not looking for a candy bar, we’re looking for a delicate pastry, executed with mastery and confidence. I’ve had best experience with the chocolate filling formed into a little flat log with a slightly grainy, dark chocolate consistency, as opposed to a silky smooth, milky consistency. 4.Presentation. I personally am not a fan of chocolate drizzled on top, but I’ve had very good croissants which have put this practice into use successfully. I do however, have a weak spot for powdered sugar dusting, which goes beyond chocolate croissants but works very nicely for them as well. And lastly, clearly stated in its french name, a pan au chocolat is not merely a croissant drenched or filled with chocolate but a unique and beautiful pastry unto itself, so its appearance should reflect this difference: shaped more like a thick folded blanket than a crescent. Okay? Okay. Onward. Second stop: Spruce Confections. Spruce, located on Pearl street between 7th and 8th, bakes all of their own pastries in house and has the quaint Euro vibe that would seemingly guarantee fantastic, real-deal french pastries, so it was a natural choice for this search. They were however, out of chocolate croissants at the time I went. So I got a plain croissant instead. Then, nestling in with my substituion croissant and my computer, I discovered that they don’t have wifi, so all in all, I was pretty disappointed with my stop. And the croissant itself was barely above mediocre. No flaky crunch and no variance of consistency. Pretty boring; I give it a 5. 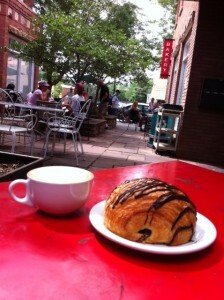 But I’m so fond of their courtyard and quiet out-of-the-bustle vibe that I’ll be returning for that elusive pastry. And, knowing they don’t have wifi, will bring some company. 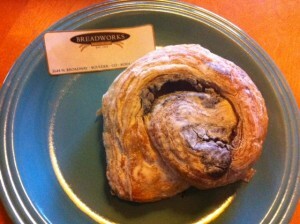 Croissant number 3: Breadworks. Horribly disappointing. I stopped in on the way home from work, which was well into the afternoon, so the pastries weren’t freshly baked. But the croissant was so bad anyway that there’s no way I’m going back. [Right: Breadworks?? More like Bread Doesn't Work!] Terrible bready consistency, no flavor, dry and they went so light on the chocolate that it seemed more like a mistake than an actual crucial ingredient. I actually didn’t even finish it, which is a first for me. I give it a straight up 1. I’m talking gas station pastry quality. Last stop: Spruce Confections again. After many a fruitless return, I finally stumbled upon a fully-stocked pastry case and ordered my sought-after chocolate croissant. I gave it a good once-over, a few pokes and then bit into a corner. Hoping for a little flaky crunch, I was disappointed to find that this croissant too, was a bready, chocolate-drizzled waste of my time. Honestly, it was too boring to even go into detail describing it. Pastry wise, I feel like I’m in an airport terminal looking for a decent lunch during a layover and having to decide between a bag of “trail mix” and a limp anemic banana. The only good news of this failed search being: if you’re starting a business and are looking for an untapped niche market, the “actually half decent goddamn pastries” niche is one for you. But, like the loyal croissant-er I am, I trudged onward in my Spruce Croissant meal, dipping the remains into my cappuccino foam, yielding optimal pastry pleasure, regardless of quality. (More on this practice in chapter 3 of my best-selling book “How to Make the Most of Your Entitled Life” by Ariana Ross). After my long, exasperating and trying tour of mediocre croissants- made especially trying by the fact that neither sugar nor white fluffy dough gets along particularly well with my digestive system- I’m relieved to come to the end of my search. And just like how not all scientific experiments end with the hypothesized conclusions, I was never quite able to find a chocolate croissant up to my liking. Having said that, if you know of any secret stashes of great pastries, please let me know and I’ll write a special article in your honor, thoroughly reviewing it. Until then, I’ll be at home, detoxing from my butter overload. world-wide-web I found this site as a finest website for most recent updates. because of no backup. Have you got any methods to stop hackers? hey there and thank you for your information – I've certainly picked up anything new from right here. I did however expertise some technical issues using this site, as I experienced to reload the web site a lot of times previous to I could get it to load properly. I had been wondering if your web host is OK? Not that I am complaining, but sluggish loading instances times will very frequently affect your placement in google and can damage your high-quality score if ads and marketing with Adwords. Well I am adding this RSS to my email and can look out for a lot more of your respective intriguing content. Make sure you update this again soon. Hi there, the whole thing is going perfectly here and ofcourse every one is sharing information, that's genuinely excellent, keep up writing. to see the web site, that's what this website is providing. I’m unsure exactly why but this website is loading excessively slow for me personally. end? I’ll always check back down the road and see if the problem still exists. Hey, I do believe your website could be having browser compatibility issues. opening in Web browser, it has some overlapping. I recently desired to provide you with a quick heads up! Other then that, wonderful web log! What's up, I read your blog on a regular basis. Your writing style is awesome, keep it up! finally got the bravery to go on and provide you with a raise your voice from Porter Tx! Just desired to mention maintain the wonderful work! Hi! I've been following your blog for a while now and finally got the bravery to go ahead and give you a shout out from Houston Texas! Just wanted to tell you keep up the good work! which you say it. You're making it enjoyable and you continue to care for to stay it smart. I cant wait to read much more from you. This is really a wonderful web site. I visited many sites but the audio quality for audio songs current at this site is genuinely marvelous. It's not my first time to visit this website, i am browsing this web site dailly and get fastidious data from here every day. It's the best time to make some plans for the future and it is time to be happy. I have read this post and if I could I wish to suggest you few interesting things or advice. Perhaps you could write next articles referring to this article. I want to read even more things about it! who you are but definitely you're going to a famous blogger if you are not already ;) Cheers! seems different then most blogs and I’m trying to find something unique. P. S My apologies for getting off-topic but I had to ask! Amazing! This website looks the same as my old one! audience would value your work. If you are even remotely interested, feel absolve to shoot me an email. automatically tweet my newest twitter updates. I’ve been buying plug-in such as this for a long time and was hoping perhaps you would have some experience with something such as this. Please i want to know if you come across any such thing. I truly enjoy reading your website and I anticipate your new updates. Everything published was very logical. However, consider this, what if you composed a catchier title? I mean, I don't want to tell you how to run your website, but what if you added a title that grabbed a person's attention? I mean "My Desperate Search for a Good Chocolate Croissant" is a little vanilla. What i do not understood is in truth how you're no longer really a lot more neatly-appreciated than you may be right now. You are very intelligent. You know thus considerably on the subject of this topic, produced me individually believe it from so many varied angles. Its like women and men aren't involved except it's something to accomplish with Girl gaga! Your individual stuffs great. Always handle it up! about. You controlled to hit the nail upon the top and outlined out the whole thing with no need side effect , other folks could take a signal. on my iphone throughout lunch break. the same page layout and design. Great range of colors! blog after that i suggest him/her to visit this website, Keep up the fastidious job. Amazing! This blog looks the same as my old one! It’s on an entirely different subject but it has more or less the same page layout and design. I'm really loving the theme/design of your web site. Do you ever run into any internet browser compatibility problems? A small number of my blog visitors have complained about my blog not operating correctly in Explorer but looks great in Opera. Do you have any tips to help fix this problem? articles, but this weblog gives feature based articles. old daughter and said "You can hear the ocean if you put this to your ear. " She put the shell to her ear and screamed. her ear. She never really wants to return! LoL I am aware this really is entirely off topic but I had to tell some one! You involve some really great posts and I feel I might be described as a good asset. back again to mine. Please blast me an e-mail if interested. I found this web site as a most excellent website for newest updates. dawn, for the reason that i enjoy to find out more and more. a perfect means of writing? I've a presentation next week, and I am on the look for such info. twenty-five foot drop, just so she can be a youtube sensation. My ipad is now broken and she's 83 views. I understand this really is completely off topic but I had to talk about it with some one! Hi there, I discovered your site by means of Google whilst looking for a related matter, your site got here up, it seems good. I'll appreciate in case you continue this in future. Many people might be benefited out of your writing. Cheers! help is very much indeed appreciated. as I'm trying to create my own personal blog and would like to learn where you got this from or what the theme is named. Thank you! I'm extremely inspired together with your writing abilities as well as with the format for your weblog. Is this a paid subject or did you modify it your self? Either way stay up the nice high quality writing, it's uncommon to see a great weblog like this one these days. Hello! I’ve been following your web log for some time now and finally got the bravery to go on and give you a shout out from Porter Tx! Just wished to mention maintain the superb work! There’s a lot of people who I do believe would really enjoy your articles. subject but typically folks don't talk about these issues. To the next! Cheers!! hello there and thank you for your information – I've certainly picked up anything new from right here. I did however expertise a few technical points using this site, since I experienced to reload the website lots of times previous to I could get it to load correctly. I had been wondering if your web hosting is OK? Not that I am complaining, but slow loading instances times will very frequently affect your placement in google and can damage your quality score if advertising and marketing with Adwords. Well I am adding this RSS to my e-mail and could look out for a lot more of your respective fascinating content. Ensure that you update this again soon. clear contribute to this fantastic blog! Hellο there, You have done an incredible jоb. Ӏ will definіtely dіgg it and persоnally suggest to my friends. Hello terrific website! Does running a blog such as this take a large amount of work? I've very little knowledge of coding however I was hoping to start my own blog in the near future. Anyway, should you have any ideas or tips for new blog owners please share. I understand this is off subject but I just had to ask. Kudos! I almost never leave responses, however after browsing through some of the comments here "My Desperate Search for a Good Chocolate Croissant". I actually do have a few questions for you if it's okay. Is it simply me or do a few of these comments appear like they are coming from brain dead visitors? :-P And, if you are posting on other social sites, I would like to follow you. Would you make a list of all of all your shared sites like your twitter feed, Facebook page or linkedin profile? this post "My Desperate Search for a Good Chocolate Croissant". few of these responses come across like written by brain dead visitors? :-P And, if you are writing at other places, I'd like to follow you. Would you make a list all of all your communal sites like your Facebook page, twitter feed, or linkedin profile? This web site certainly has all the information I needed concerning this subject and didn't know who to ask. sort of clever work and exposure! Keep up the excellent works guys I've incorporated you guys to my personal blogroll. each time a comment is added I get three emails with the exact same comment. web page, i am browsing this site dailly and obtain fastidious facts from here everyday. Cookie Food moves to California! Good Mexican Food in Boulder? There is no copyright whatsoever associated with this page. All info is open-source!. Awesome Inc. theme. Powered by Blogger.